Seeing as they both were born in the Victorian Era, I think it's safe to include them on my Steampunk blog. Houdini was born March 24th 1874 in Budapest Hungary. Fatty Abuckle was born March 24th, 1887. I'm going to include a blog article that I wrote several years ago which will give you some biographical information on the two men. We all know it's Houdini's birthday. But did you also know that Rosco 'Fatty' Arbuckle was born on this day in 1887? Fatty Arbuckle was a pioneer comedian during the Silent Film era. He holds the distinction of being the first person to be hit with a pie on film! When newcomer Charles Chaplin was hired by Mack Sennett to replace a comedian who had just left, Chaplin borrowed the pants of none other than Fatty Arbuckle to help create his character 'The Tramp'. Houdini and Fatty actually had a fair amount in common. Fatty Arbuckle began his career in Vaudeville as a singer and dancer. Houdini of course was the King of Vaudeville Entertainers. In the book, Roscoe "Fatty" Arbuckle: A Biography Of The Silent Film Comedian, 1887-1933 by Stuart Oderman, he says that early in their careers both Fatty Arbuckle and Houdini liked to sleep at train stations, likely due to the fact they were making very little money in the early days. 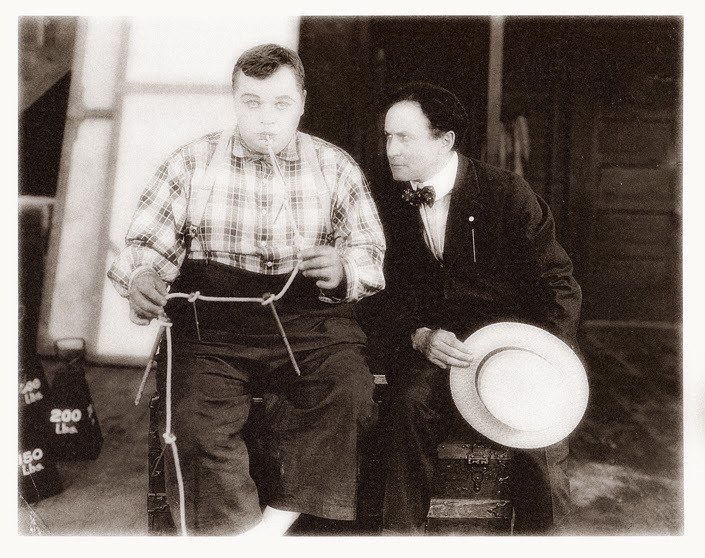 Fatty and Houdini have something else in common, Buster Keaton. Legend has it that it was Houdini who gave Keaton the nickname Buster. Well, Keaton was a vaudeville comedian and Fatty brought him out to California to be in one of his films. So it was due to Fatty Arbuckle that Buster Keaton got his start in movies. "Acquittal is not enough for Roscoe Arbuckle. We feel that a great injustice has been done him. We feel also that it was only our plain duty to give him this exoneration, under the evidence, for there was not the slightest proof adduced to connect him in any way with the commission of a crime. He was manly throughout the case, and told a straightforward story on the witness stand, which we all believed. The happening at the hotel was an unfortunate affair for which Arbuckle, so the evidence shows, was in no way responsible. We wish him success and hope that the American people will take the judgement of fourteen men and women who have sat listening for thirty-one days to the evidence, that Roscoe Arbuckle is entirely innocent and free of all blame." Hollywood executives, several days following the verdict decided they would take matters into their own hands and blacklisted Fatty Arbuckle from making pictures. Wait? Wasn't he totally innocent? Guess that didn't matter. However, by 1925 Fatty was back, but under an assumed name, William Goodrich, though this time he was not starring in the movies, he was directing them. Eventually in 1932, the ban was lifted and Fatty was allowed to star in movies again. He was hired to make six two-reel movies. The day after completing them, he died. Like Houdini, he too died young, he was only 46. About the woman, Virginia Rappe. She didn't die at the hotel, nor did she die while Abuckle was present. She died four days later in the hospital. The cause of death, peritonitis, just like Houdini. It's unfortunate that Fatty and Houdini both died so early. I'm sure they both had a lot more entertainment to give the world. In fact, after their deaths, they would be connected one more time, in a movie called Days of Thrills & Laughter. and Happy 127th Birthday to Fatty. *One more note about Fatty. This would make Houdini jealous as it seems that Mr. Arbuckle is still fooling people many years after he died. He is listed in a number of biographies as being buried in Forest Lawn Cemetery in Los Angeles, he is also listed as being buried in Woodlawn Cemetery in the Bronx. The truth however is that he was cremated and his wife scattered his ashes over the Pacific Ocean. I think to day is Houdini's 140th birthday not 137th as indicated at the bottom of your post today. You are correct. I copied that from one of my other blogs and I thought I changed the numbers, but apparently I didn't! Thanks for letting me know!